The Most Rev. 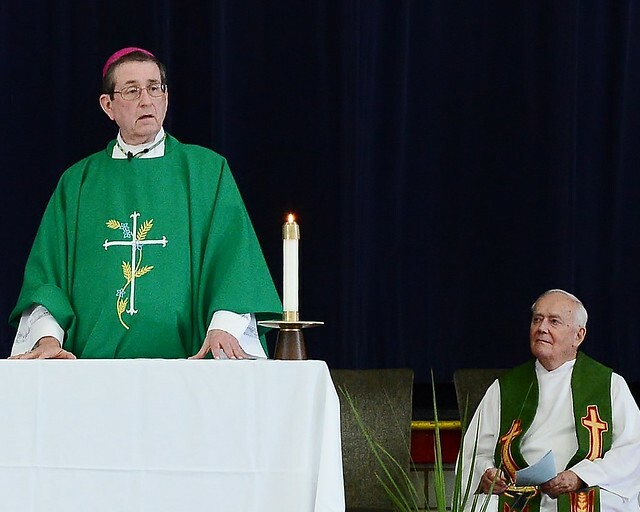 Richard G. Lennon, Bishop of Cleveland, celebrated the Opening Mass for VASJ’s new school year on Thursday, September 5. The gym was full and vibrant with live acoustic music as the entire student body, faculty and staff were joined by alumni, friends and members of the Ursuline Sisters of Cleveland, Marianists and VASJ Board of Advisors. Principal David Csank welcomed special guests including Secretary for Education/Superintendent of Schools Margaret Lyons and Associate Superintendent for Secondary Schools Gene Boyer. President Richard Osborne ’69 greeted Bishop Lennon, pledging that faith would remain at the foundation of the school’s mission throughout the year. VASJ Chaplain Fr. Jim Barlett, SM, served as the concelebrant for the Mass. “Let us take this time to be here together at the start of the school year and pray that it be a very important year in our lives,” said Bishop Lennon during Mass. 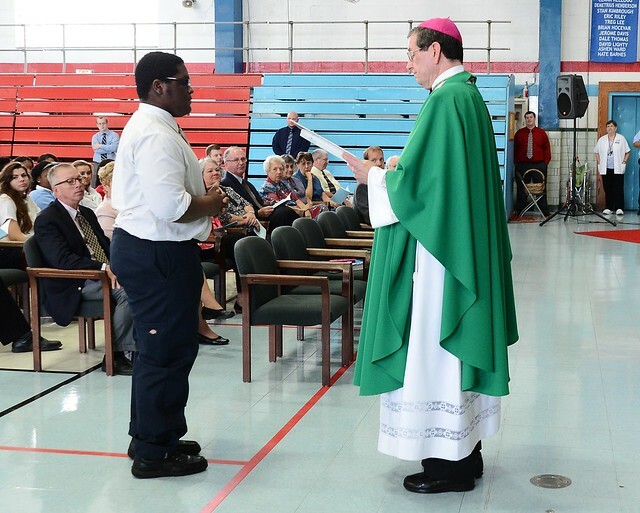 The Bishop, who arrived at the school hours prior to the Mass to meet with students and members of the faculty and staff, said he was very pleased with all that he learned about the continued increase in VASJ’s enrollment and the positive direction of the school. “We have a lot that is uplifting as we start this new school year,” he said. For VASJ senior Nicholas Uitenham, it was a particularly special celebration. Not only was it the official kickoff for his senior year, but after three years of preparation he was commissioned by Bishop Lennon as an extraordinary minister of Holy Communion. At the conclusion of the Mass, visitors were welcomed into VASJ’s Ministry Center for a light reception. It was a wonderful way to officially start the 2013-14 school year. Just as Bishop Lennon urged the students, we plan to “keep that good family spirit” going strong throughout the remainder of the year. View more photos from VASJ&apos;s Opening Mass.